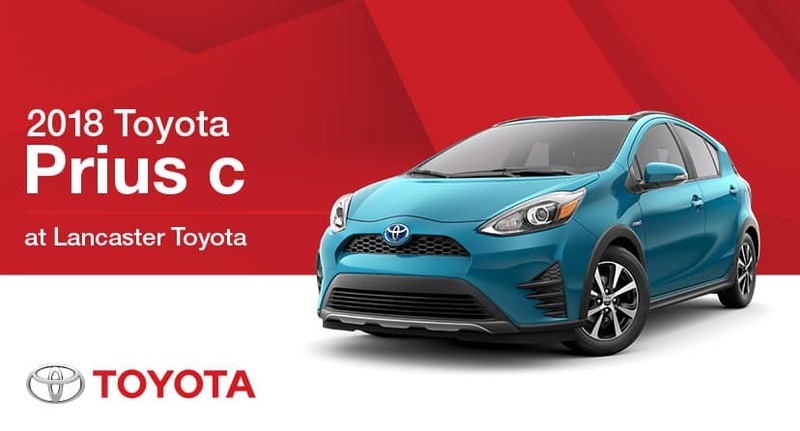 The 2018 Toyota Prius c takes the efficiency of the classic Prius hybrid and packages it into a smaller, more compact vehicle to suit your needs and push the bounds of efficiency. Despite its smaller size, safety is still a top priority for the Toyota Prius c with the standard Toyota Safety Sense™ C suite of technology features. Get your Prius c with some added flare thanks to a range of fun colors, including Absolutely Red, Tangerine Splash Pearl, Blue Streak Metallic, and Tide Pool Pearl. The 2018 Toyota Prius c is available in four trims: One, Two, Three, and Four. Interested in learning more about the 2018 Prius C? Test drive one at Lancaster Toyota today.